I just put in a PnP brake booster, the old one made Darth Vader noises. I cant see much due to the location of the switch and my lack of flexibility. So is it as simple as giving it a little bend or does it need to be shimmed? My 242 is a 78. Having the RR light unplugged shouldn't matter right? Once finished I noticed the LR taillight stayed on. Tail light or brake light? Usually both sides (brake and/or tail) should be on or off at the same time. Does your car have a rear fog light? Usually only 1 bulb on the driver's side is functional, with a separate dash switch for it. Might not exist on your year. * Probably not... 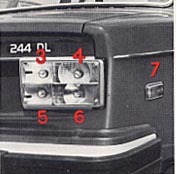 Owner's Manual ( volvo.custhelp.com ) doesn't show a rear fog, just 4 in a square. Goes off when pulling on the brake pedal. My boy came over and took a look. We figured it needed a couple smacks with a hammer and seems to be working fine now. Loosened the column bracket first.